As a fan of speculative fiction, one of the fun things to do is attend Conventions. As you know, my husband and I attended our first one in May–TimeGate 2013. We might be attending a few more this year and I wanted to share some with you that will be coming up in the next four months. For those of you who, like us, have a love of comic books, the Atlanta ComicCon is a great place to score. This one day event happens a few times a year and only has a $5.00 cover fee. You can go to their website and get a $3.00 off coupon. We are hoping to catch this show again this year. I’m in need of a few Dr. Who editions. 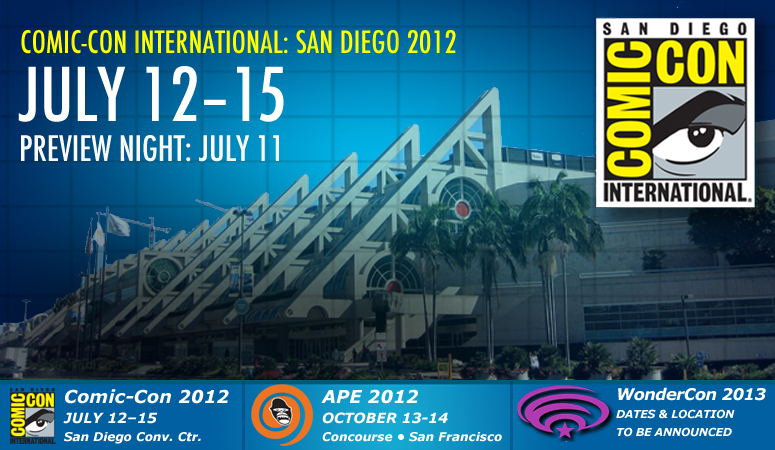 San Diego ComicCon the granddaddy of them all will be July 19-21 at the San Diego Convention Center. This is the biggest Con in America and is the mecca for all geeks. If you want to go, start planning at least 18 months in advance so that you can get your membership and hotel accommodations early. Oh, and take plenty of 5-Hour Energy with you as well. Going to this ComicCon is on my “Things to do before I’m 50” list. Louisville KY, is the home of Fandomfest which will be held on July 26-28th at the Kentucky International Convention Center. A few of the guests will be Gillian Anderson of X-Files, some of the cast of The Walking Dead, Saul Rubinek and Eddie McClintock of “Warehouse 13”. As well as the kings of science fiction and comics William Shatner and Stan Lee! (how I wish I could go). Boston ComicCon is coming up August 3-4. BCC will be held at the World SeaPort Trading Center and is the talk of the North East. Some of my favorite actors/actresses will be there: Eve Myles from “Torchwood” (and one episode of “Dr. Who”), and Laurie Holden of the “Walking Dead”. If you are into comic books, you’ll be happy to know that the following artists will be on tap: Josh Adams, Neal Adams, Mark Bagley, George, Perez, and Alex Suviak. August 30-Sept 2 is the South East’s version of what happens in San Diego. Dragon*Con! Three and a half days of geeked out-of-your mind fun (or so I’ve heard. I haven’t been yet, *sob sob). DC is held at about 4-5 hotels here in downtown Atlanta. If I’m not mistaken, the memberships for the entire weekend have been sold out. There might be some individual day memberships left. But even if you can’t afford to go and you reside here in the Atlanta Metroplex, it’s still worth it to get up on Saturday morning and head downtown for the Dragon*Con Parade. I plan on being there for that. New York ComicCon will be held on October 10-13 this year at the Javits Center. This is another must-do pilgrimage for members of the geekdom. I plan to go one year as a birthday present to myself. This year’s event will host such greats as Eva Myles, Felicia Day and Josh Gates. There’ll even be a Hunger Games Costume Exhibition this year. These are just a few of the fun Cons to hit this summer. For more information check out the following resources: Southern Fandom Resource Guide, Costume SuperCenter, Locus Magazine, California State University Library. If you have been to a con in the past, which one was your favorite? Please share, as all us geeks love to live vicariously through each other.